Tropical Paradise. It has a nice ring to it, don’t you think? I do and it fits perfectly with my Super Bowl menu. Ok, if you are not a Super Bowl fanatic, then think of this drink as the perfect addition to your cocktail repertoire. My friend Melissa had an amazing pineapple infused vodka drink at her Halloween party and I decided to tweak it a bit. I also wanted to make a drink with vodka that was different from those I had previously made. That was how Tropical Paradise came into being. I steeped the pineapples in vodka for 48 hours. Any longer and the acidity of the pineapples would have ruined the drink. I strained the vodka and then sautéed the pineapple chunks in butter and brown sugar. What separates Tropical Paradise from your average drink? Adding pineapple coconut ice cream, of course! Drop a scoopful into the glass of vodka and watch it dissolve, if you can resist scooping it out. I must admit that I failed miserably every time. Remember those pineapple chunks I sautéed? Well, I put one on the edge of the glass to dress it up. You will have many left over, so get creative. Just remember, FOR ADULTS ONLY! When one soaks pineapple chunks in vodka for 48 hours and then eats them, they will knock you on your derrièr! Now that you realize how incredibly decadent Tropical Paradise is, good luck waiting for Game Day to try it out. I know I won’t be waiting that long! Place the pineapple chunks into a pitcher. Fill the pitcher with vodka. Cover and wrap in plastic wrap. Store in a dark, cool place for 48 hours. Strain the pineapples and drain excess vodka. Store the vodka in the refrigerator or the freezer. Melt the butter in a saute pan. Add the pineapple chunks and brown sugar. Saute until the liquid evaporates. Cool completely. Pour the vodka into a glass. Add a small scoop of pineapple-coconut ice cream. Place a wedge of pineapple on the glass and serve. There aren’t exact measurements for this recipe because it is completely dependent on the size pitcher used. If you are making a very large batch, you will probably need to add more than 1 pineapple. Remember that the pineapple has soaked in vodka for 48 hours and is very potent. If you store Tropical Paradise in the freezer, it will become a slushy. A very adult slushy! Additional time is needed for the pineapples to steep in the vodka. Super video; love the music that accompanies it and the drink looks spectacular. Have no intentions of waiting for Super Bowl Sunday! Thanks so much! I don’t blame you for not waiting until Super Bowl Sunday! 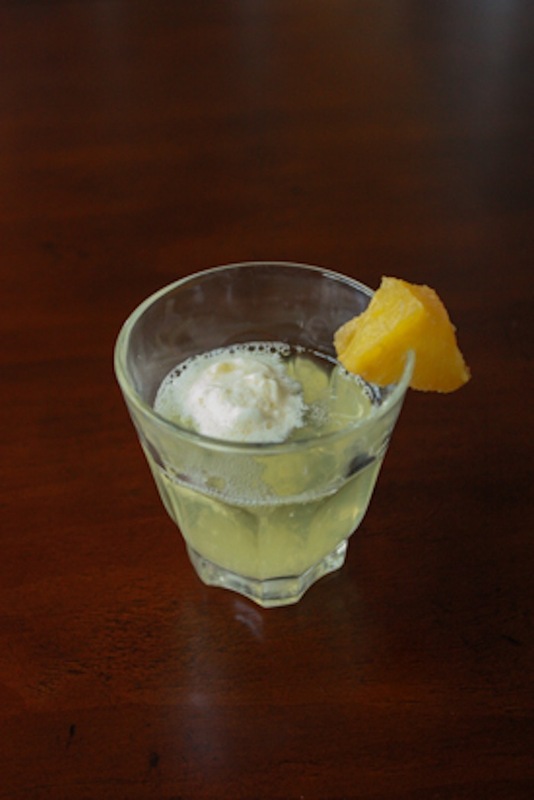 Sweet dreams are sure to follow after a sip of Betsy Cohen’s Tropical Paradise vodka-ice cream concoction!…I’ve been on overdrive recently and would love this drink – before game day! I think you deserve a pitcher of Tropical Paradise ANYTIME!! Aloha, that video was Sweet! Great video! This sounds amazing and I can’t wait to try it.